অনেক ঐতিহাসিক ও পণ্ডিত লিওনার্দোকে "ইউনিভার্সাল প্রতিভা" বা "রেনেসাঁ মানব" আখ্যা দিয়েছেন।. ↑ This drawing in red chalk is widely (though not universally) accepted as an original self-portrait. 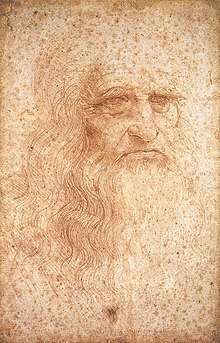 The main reason for hesitation in accepting it as a portrait of Leonardo is that the subject is apparently of a greater age than Leonardo ever achieved. But it is possible that he drew this picture of himself deliberately aged, specifically for Raphael's portrait of him in The School of Athens.